Gemini North image of the planetary nebula M97, also known as the Owl Nebula, imaged by the Gemini Multi-Object Spectrograph (GMOS) as part of a Canadian contest for high school students. The approximately 6,000 year-old nebula is located about 2,600 light-years away, and has a diameter of about three light-years across. It is located in the constellation of Ursa Major (which contains the Big Dipper). 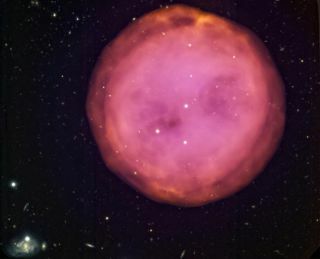 A new image of the Owl Nebula taken by the Gemini Northtelescope in Hawaii is the result of a student essay contest in Canada, wherestudents picked their favorite object in the sky in hopes the observatory wouldsnap a photo of it. The space photo contest invited high school students from across Canadato choose their favorite object in the sky and explain in an essay why theywould like the Gemini science team to observe it. Four professional astronomersand science educators reviewed the almost 50 entries sent in to select awinner. The prize went to high school student ?milie Storer fromColl?ge Charlemagne, in Pierrefonds, Quebec, who selected the ultimate target of the newimage and said, "I definitely want to be an astronomer now!" At a celebration at her school, Canadian Gemini OfficeAstronomer Andr?-Nicolas Chen? and former Gemini Science Fellow ?tienne Artigau(now at the Universit? de Montreal) explained to the more than 250 students inattendance how the planetarynebula formed and what is known about it from previous studies. A live video-link to the Gemini North control room, locatedatop Mauna Kea, Hawaii, allowed students to see where the observations of the Owl Nebulawere made and talk to staff at the observatory. The scientists also talked about what the new observationsprompted by ?milie's win might reveal about the nebula. "This extended and impressive nebula from the northernsky has surprisingly not been imaged much by large telescopes. ?milie?s dataare now the best available set of data on this object," Chen?, whoproduced the final image, said. Dr. Sun Kwok, Dean of University of Hong-Kong and a worldexpert on planetary nebulas, inspected the new Gemini data, which he used torefine his model of the nebula. "Rather than a simple ball of gas as the Owl Nebula haspreviously been thought to be, the Gemini images reveal that this is a bipolarnebula with a cylinder-like outer structure, and the pair of ?eyes? arecavities cleared out by a fast gaseous outflow. Most interestingly, theorientation of the outflow is offset from the axis of the cylinder by 36degrees," Kwok said. It is expected that ?milie will be invited to be a co-authoron a future article in a professional astronomy and astrophysics journalpresenting these results [more nebulaphotos]. The contest, which is sponsored by the team of scientistswho coordinate Gemini observations for Canada (the Canadian Gemini Office), atthe National Research Council of Canada?s Herzberg Institute of Astrophysics(HIA), was created to encourage students to participate in science activities.